The other night, I made too much basmati rice to go with a curry for dinner so I spooned the extra cooked rice into a medium-sized soup pan and improvised this recipe. It turned out wonderfully! I ate some warm that evening then enjoyed it chilled with friends the next day as a lunchtime treat. Here is the recipe, which is very easy. 1. In a medium pan over medium heat, pour the can of coconut milk, orange essence, and orange juice. Stir in the sugar and cardamom, and dissolve completely. Spoon the cooked rice into the pot and stir to loosen clumps. Cover and let cook for 15 minutes. 2. After 15 minutes, stir in the coconut and 1 tablespoon of the orange zest, then decrease the heat to low, cover, and cook for an additional 45 minutes. 3. Remove the lid and let cook for 10 minutes then remove from heat and let cool before transferring to a container with a lid and refrigerating until time to serve. 4. 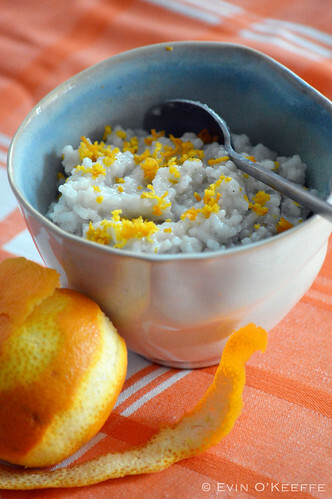 Spoon the rice pudding into small serving bowls. 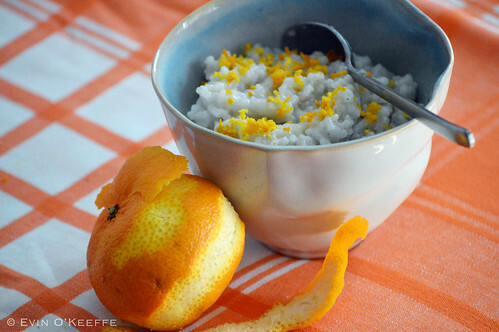 Before serving, sprinkle remaining tablespoon of orange zest atop each serving. This entry was posted in Dessert and tagged dessert, vegan, Vegetarian.